I know a lot of bento makers buy their bento stuff from J-List – and a lot of us also run affiliate programs with the company, whereby if you click on a link from our sites and purchase items, we can gain store credit or cash in return. I’ve also set up an affiliate program here just like at Bento Business – if you want to support the site, you can do so right along at the same time as feeding your bento obsession by clicking here. (You can also reach the site without taking part in the affiliate program by clicking here.) Whilst browsing today, I came across this super cool kinda-bento related item I just had to share, because it’s so damn cute! 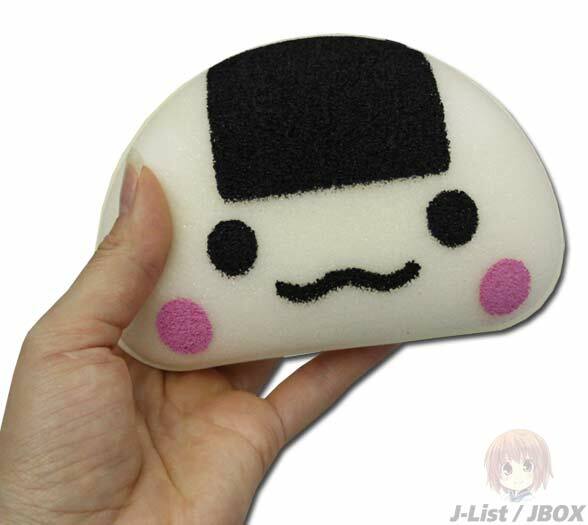 This, my friends, is an onigiri kitchen sponge! Let’s pretend it’s totally practical and wouldn’t be at all weird and creepy when you actually start using it and its face gets all dirty and brown… Sometimes, the truth just hurts too much. J-List claims you can use this for bathtime fun as well… Okay, it’s cute, but I don’t know how much fun can really be had with a novelty sponge (or am I missing something?) You can also get a banana version… Has anyone got one of these things? They’re fricken awesome! Thus ends the word from our sponsors… normal service will now resume! Hampshire Farmer’s Market – part two! So cute, I want one to sit and look pretty on my bento cabinet! I wonder if they’re made of soft material or if they’re hard sponges… I bet you could make one out of felt! Maybe a future project for my limited sewing skills?? ?